It is common, and perfectly normal, to have some degree of apprehension or anxiety prior to receiving dental treatment. Some people, however, have stronger feelings in this regard than others. Whatever the cause, apprehension or anxiety can produce many unpleasant effects, including heart palpitations, high blood pressure, upset stomach, and trouble sleeping the night before the appointment. Many highly apprehensive patients avoid dental care for years, until their problems become so severe that they are forced to seek emergency care. Our goal is to help you achieve and maintain a healthy mouth as efficiently and comfortably as possible with sedation dentistry in Woodland Hills, CA. Modern methods in anesthesia make dental treatment safer and less stressful. You will find our office is designed for your comfort, and our staff is dedicated to the effort of making your visit pleasant. We offer an open waiting room with a completely delightful staff, ready to accommodate all your needs. Our office is light and open to promote a stress-free environment. In addition, we provide LCD televisions and noise reduction headphones to help put you at-ease. The use of sedation and anesthesia in dentistry has a commendable record of safety, due to the advanced training required to achieve certification. Dr. Dan P. Hilton is licensed by the California State Board in both intravenous and oral moderate sedation, used mostly for our more apprehensive patients, or for those looking to ease themselves through longer dental procedures. Special permitting and updating of that permitting is required to administer sedation and anesthesia to our dental patients in an ongoing safe environment. The ability to handle emergency situations, as well as having specific emergency medications and equipment, is a mandatory part of the permitting process. All of our staff have undergone extensive training in all aspects of sedation dentistry. IV Sedation (also known as Conscious or Moderate Sedation) – With intravenous sedation, medications are administered directly into the blood stream. While this method is commonly used by oral surgeons, we are one of the few dental offices in the state of California (.5%) that have received the specialized training and certification to provide this service to our patients. This procedure has allowed our practice to simplify the process for patients who may require or prefer this specialized care. The medications used for IV Sedation are more effective than the same that are taken orally. We often involve oral sedation and/ or nitrous oxide inhalation procedures in combination with our IV procedure to enhance your comfort. In more complex cases we offer deeper sedation via an anesthesiologist or nurse anesthetist (CRNA). Oral Conscious Sedation -- Patients interested in oral conscious sedation are given oral medication that promotes a state of deep relaxation. As medications used in oral conscious sedation can differ, we recommend the method that will best suit your needs. Oral conscious sedation is ideal for many patients, and helps their appointment time pass quickly and comfortably. Nitrous Oxide – This gas is administered through a small mask placed lightly over your nose and mouth. Nitrous is perfect for shorter visits, as it creates a moderate level of sedation and can be reversed with the inhalation of pure oxygen. Sedation is also an ideal solution for patients who desire to have extensive or multiple procedures completed in the fewest number of appointments, such as dental implants or cosmetic dentistry. Want to Learn More about Woodland Hills Sedation Dentistry? It is possible to have an anxiety-free dental experience! Dan P. Hilton, D.D.S. is a board-certified IV sedation dentist in Woodland Hills, offering various sedation dentistry options for a stress-free dental experience. No matter what your fears or concerns may be, we offer a technique that will be effective for you. If you would like to schedule an appointment or hear more about how sedation dentistry can help you, please contact us at our office today. 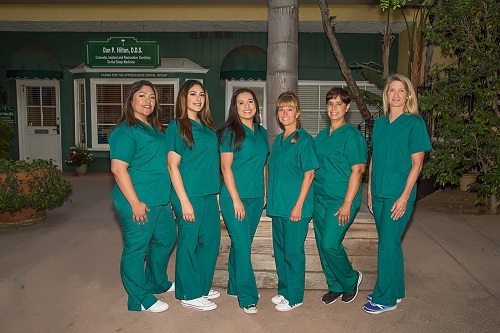 We focus on care for the apprehensive dental patient and are proud to offer nitrous oxide, oral conscious sedation, and IV sedation dentistry to meet your needs.